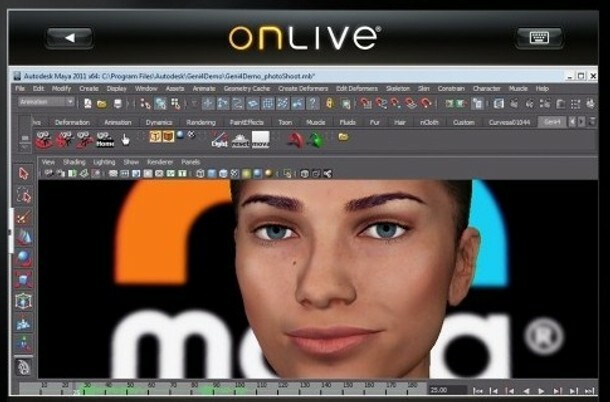 Streaming games service OnLive looks set to broaden its horizons to serve general computing applications – including 3D packages like Maya. Company founder Steve Perlman showed off the software running on an iPad via the OnLive service at yesterday’s D: Dive Into Mobile conference. Instead of running on the local machine, the OnLive system enables software to run in the cloud. Video of the result is then streamed to the local machine. In this case, the result is Maya ‘running’ on a device that would not normally meet its hardware requirements, but the same technology could be used to provide the software on a standard PC on an online rental basis. There’s still a way to go before you will be able to use Maya over the cloud in any practical way, as this article at Engadget summarises. But OnLive has just taken another definite step towards that goal, releasing its new free Viewer app in the iTunes store.